The current Palmer Station was constucted by Navy SeaBees beginning in 1968. Palmer is Located on the southern end of Anvers Island on the Antartcic Peninsula. This is the smallest of the United States three year round research stations and provides a very unique environment for research. 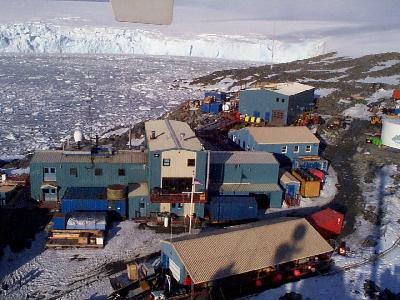 Palmer Station (and the research vessel Nathaniel B. Palmer) are named after Nathaniel B. Palmer, American sealer who explored the Antarctic Peninsula in 1820, 1821 on the Hero and the James Monroe. Take a Virtual Tour of Palmer Station. If the graphics are loading slowly, Try the thumbnail verion of the Virtual Tour.